PDFs are great when you’re trying to send out a form or rules for a game, but sometimes you just need to make a few changes without going back to the source document. Thankfully, there are a couple of ways to quickly change your PDF files into easy-to-update Word documents before saving and redistributing them. Here’s how to convert any PDF file into a Word document. Using Acrobat is the best way to make sure your conversion’s formatting is as accurate as possible. However, you’ll need the paid version of Acrobat to use this method. 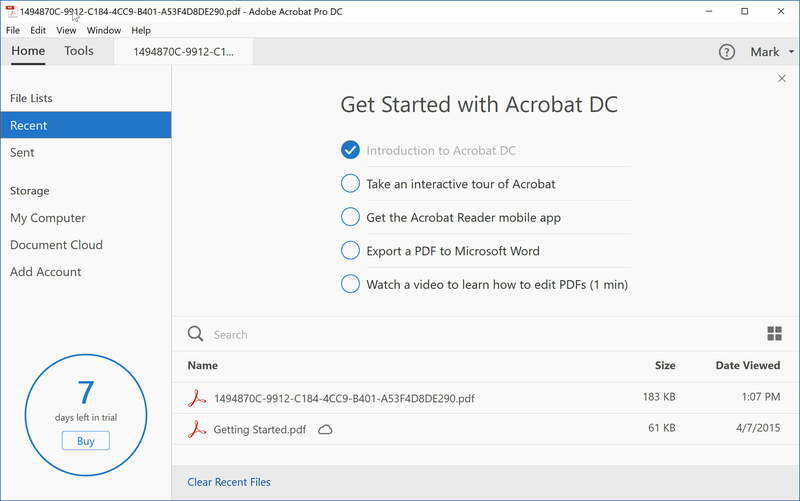 Adobe currently offers a free, seven-day trial of Adobe Acrobat Document Cloud (DC), which you can use for one-time conversions. Note that this trial is designed to prevent you from signing up for it repeatedly, so think of it as a one time only option. If you need to make conversions on a regular basis, you’ll want to pay for the full version, which runs approximately $13 a month with an annual commitment, or as part of an Adobe Creative Cloud package. Step 1: Open the PDF you’d like to convert in Adobe Acrobat. 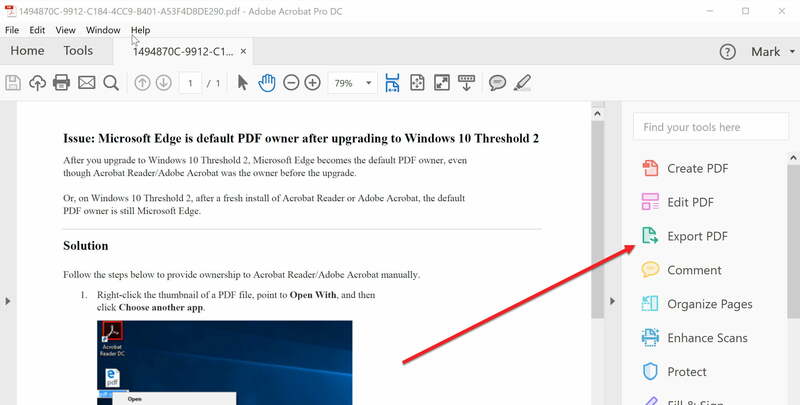 Depending on your preferences, PDF files may automatically open in Acrobat. Step 2: In the right-hand pane, look for Export PDF. Click it. Step 3: Click on Microsoft Word, which will present you with format choices: Word 97-2003 (.doc) and Word 2013-2016 (.docx). 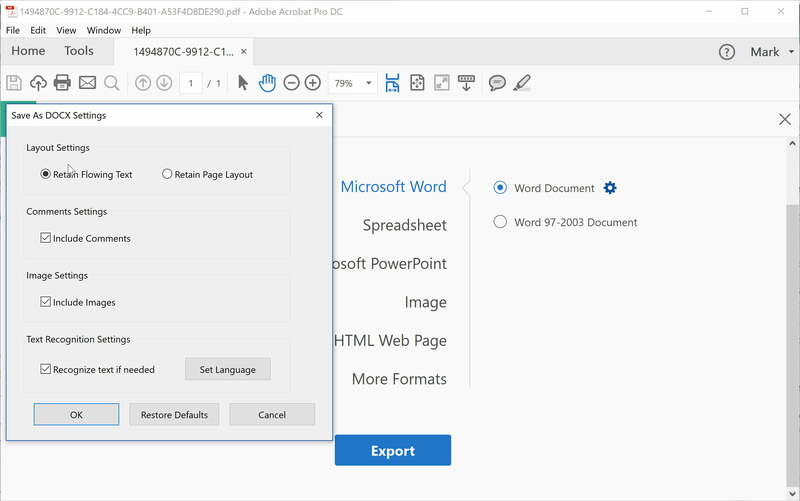 If you go with a .docx file, you can hit the settings cog and set additional options, such as the ability to retain flowing text or the PDF format. Choose your ideal format and settings, and click the Export button. Step 4: Adobe will automatically run text recognition for any scanned text during this step. The text recognition doesn’t always work, but for most legible text, it’s an ideal solution. Keep in mind that you may need to do some quick reformatting in your new Word doc afterward. Step 5: Name your new Word file and save it in your desired location. Microsoft Word is a great, free way to convert PDFs to Word documents — if you have Office already. Of course, the formatting doesn’t always line up and the text may not be exact. If you have Acrobat or don’t mind trying a web-based converter, we suggest trying another option if the formatting is unusable. After all, other solutions may be more accurate. Step 1: To begin, launch Word and click File. Then, click Open from the resulting menu as though you were opening another Word file. Step 2: Locate the PDF file you want to convert. You can either search for it by name or navigate to the location where it’s stored and browse for it. Once selected, click Open. Step 3: That’s it! Word will try to automatically convert the content of your PDF to a new Word file. Although they don’t all have conversion tools, these are the best Microsoft Office alternatives. There are a number of web-based services that you can use to convert PDF files to Word files. If you don’t have immediate access to Acrobat or Word, then you may want to try one of the freemium programs listed below. Simply upload your file, pick your preferred conversion method, and start the process. These apps can send the PDFs to a variety of places, from email to cloud storage. This converter will email the Word file to an address of your own choosing, which may be useful when collaborating on projects for business or school. You can download it free for 14 days or use the free web service. FormSwift’s PDF Editor is one of the best editors out there and it lets you save in PDF or DocX formats, letting you make a straight conversion after any edits you might want. If you’re happy to sign up for a free trial account too, you can even email the resulting tiles to yourself or a collaborative partner. Smallpdf is fast, simple, and free — all things you want in a handy web app. Smallpdf also lets you upload from, and export directly to, cloud storage solutions like Dropbox or Google Drive. Smallpdf deletes any uploaded file from the servers after one hour for privacy. LightPDF is your one-stop shop for all your document conversions. Not only does it convert your PDF into a Word file, but it also can convert it into a PNG, JPG, PPT, and TXT. It will also convert your doc back into a PDF. LightPDF is free, easy to use, and above all, safe. LightPDF guarantees total security of your uploaded document.